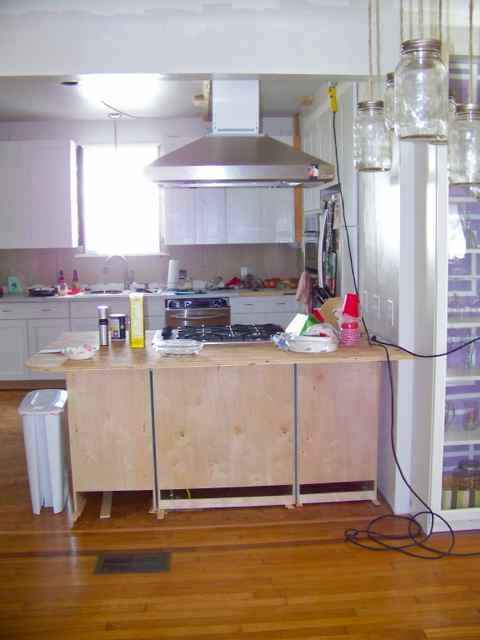 The kitchen peninsula was probably the most frustrating of the cabinets to install. The reason for this was that since there was only the one wall, it was really easy to make the island wonky instead of straight. Another issue was that since our floor slopes ever so slightly where the old wall was, it took a lot of shimming to make the cabinets level. Since our floor has distinct lines in it, we knew that if the peninsula wasn't parallel to those lines your eye would pick up on that right away. Instead of worrying about the first cabinet being completely flush with the wall, we measured the distance between the base of the cabinet and one of the lines of the floor and made sure that the measurement was consistent for all of the cabinets. 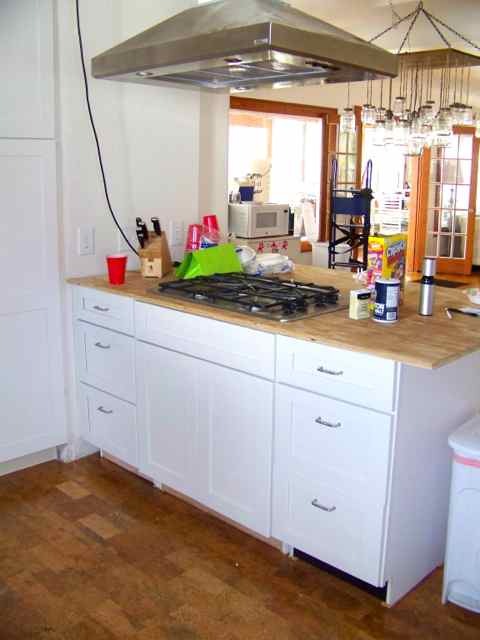 Once we had the cabinets straight, then we worried about leveling. We used the same approach described here to make sure the cabinets were level on their own and with each other. 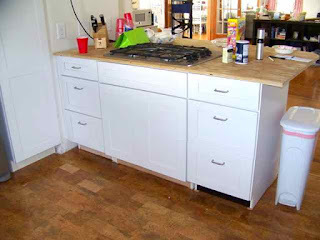 We had to be really careful to make sure the cabinets stayed straight while we leveled. 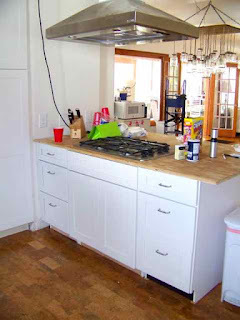 After the cabinets were both straight and level, we had to make sure they wouldn't move. 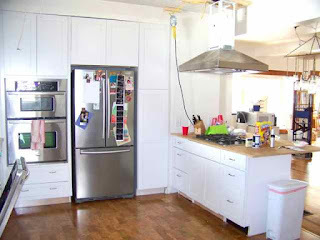 We decided the best way to do this was to secure the first cabinet to the wall and then attach the rest of the cabinets to each other. 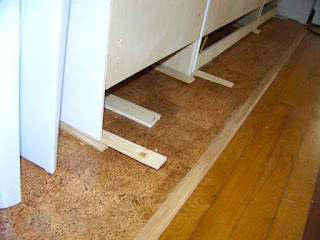 To do this we used shims to fill in the gaps and then the first cabinet got screwed into the wall and the rest we used our nail gun to secure the cabinets to each other from both sides. We did this for both the front and back of the cabinet and once we were done the cabinets were fairly secure. Once the granite goes on the top, there will be no moving this thing. After the counters go on we will also be able to put the back on the peninsula. We need to leave this exposed (and leave the toe kick off) until the countertops are installed just in case we need to adjust the levelness a little. So that's it for cabinet installation! 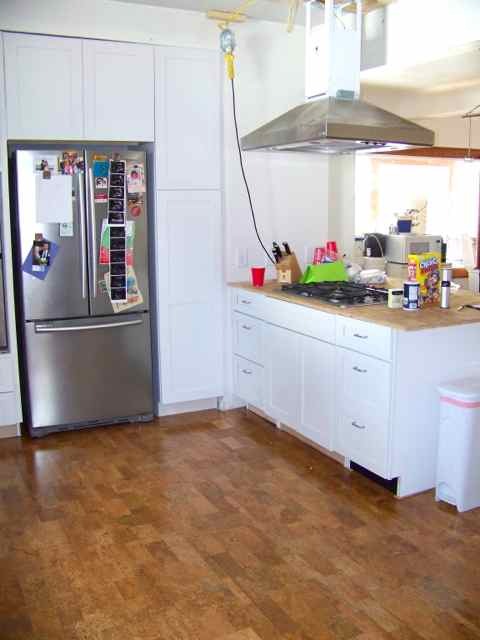 The kitchen definitely doesn't feel done yet but it is usable and so much better then before. We're also getting out counters installed day after tomorrow so I am SUPER excited about that!